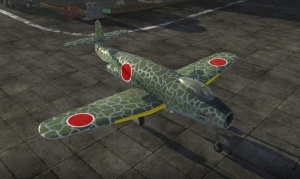 The R2Y2 Keiun-Kai V3 is a Rank V Japanese jet bomber with a battle rating of 7.3 (AB/RB) and 7.7 (SB). It was introduced in Update 1.43. The R2Y2 series of aircraft features a devastating battery of weapons mounted centrally within the nose. Much like the Me 262, the lack of a piston engine mounted within the nose allows for much larger cannons to be placed within the space it would have occupied. 4 x 30 mm Type 5 cannons with a ammo load of 600 rounds (150 rounds per gun) means the R2Y2 is effective at almost any role you chose to play it as. 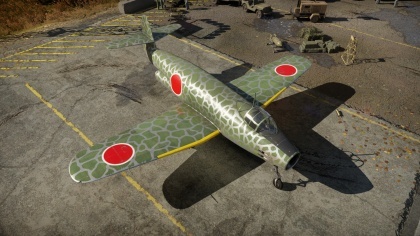 Attacker or interceptor, the R2Y2 is an effective multi-role aircraft for the Japanese at era V.
The R2Y2 is best utilized as a fighter in all game modes. 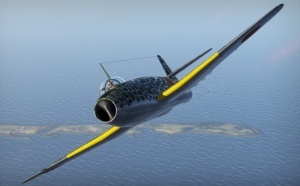 As it is classified as a "jet bomber" in realistic battles, it gets to start in the air and farther forward than the rest of the team. This is crucial in the aircraft's survivability, as it can become a daunting task to regain altitude once lost. This being said, the R2Y2 is very much a medium altitude fighter. Once the R2Y2 pilot loses his or her speed, they are easy prey for fast-accelerating planes like the F7F. It is important to always have a high speed when attacking enemies as they will often be able to slot in on your tail in a matter of seconds. This short time can be a matter of life or death as many fast-turning propeller aircraft such as the Spitfire wield impressive armaments with high burst masses. However, these advantages can be nullified once the R2Y2 pilot has the ability to dive away at high speeds. If tailed, it can often be difficult to evade enemies with this aircraft, jet engines or not. Many propeller planes like the Tempest can easily stay with a diving R2Y2. If found in this situation, the R2Y2 pilot has a few choices. One, the best method is to call for teammate assistance. Not only can one keep the enemy greedy and focused on his or her tail, but this pilot can also "set up" that enemy for a teammate to destroy. If found alone, it can be possible to catch propeller planes in a "speed trap" where once you start to outrun the enemy you pitch up to gain altitude. Once the enemy prop stalls out, dive on them. If the first pass doesn't result in a massive fuel fire and explosion, set up the same approach as before. Even if the propeller plane has the ability to outmaneuver the R2Y2, it is still very daunting to have to dodge an aircraft armed with four 30 mm cannons. The R2Y2's biggest downfall is its speed. Start by unlocking the performance modules first, as they will increase survivability more so than any armament upgrades. Being able to use the "Stealth" belt for the 30 mm cannons is a huge advantage over Tracer and Universal, provided you can aim, as the Tracer shells halve the HE fillers. The single-seat land-based Kugisho R2Y2 Keiun-Kai or "Beautiful Cloud" was a planned jet powered Reconnaissance Bomber/Attacker based on the two-seat R2Y1 Keiun. The R2Y2 would feature an armament of 4 x 30 mm Type 5 cannons and external bomb load of up to 800 kg. The powerplant of the jet Keiun-Kai would be a pair of Mitsubishi Ne-330 turbojet engines mounted in pods located, with one under each wing. Later versions (V2 and V3) would feature the engines mounted centrally within the fuselage. The Y-40 project began with failure of the Kugisho R1Y1 (Y-30) project for a fast, high speed reconnaissance aircraft. The development of that project, along with inspiration from the German Heinkel He 119, the R2Y (Y-40) project was developed. 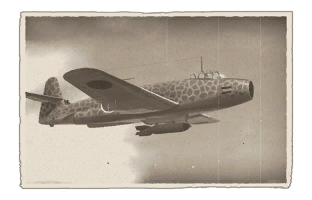 Initially intended as a fast reconnaissance aircraft with a long range that could be operated from land bases across the Japanese Empire, that would avoid interception with high speed flight, however Kugisho also informed the IJN that the aircraft could be adapted to other roles. They proposed that the planned Aichi Ha-70 engine powerplant of the R2Y1 could be replaced by a pair of Mitsubishi Ne-330 turbojet engines. Nonetheless, work on the R2Y1 continued, however it proved troublesome due to the Aichi powerplant. By April 1945 the first prototype of the Keiun was ready for initial trials, with the first flight in early May of the same year. The R2Y1 suffered engine-cooling issues during its early development, and a fire occurred during ground-testing that would damage the aircraft and its powerplant. The final variant of the R2Y2 family, following on from the V1 and V2, the V3 features a major change compared to the last two that makes it stand out from its predecessors. The V3 uses a nose intake rather than the ones featured within the wing roots on the V2 or the wing mounted pods of the V1. The nose intake being quite a radical step away from what was common on jets of the era and something that is more reminiscent of the F-86 Sabre or MiG-15. As well as this, the V3's tail-plane is also mounted slightly higher to achieve more of a "T" shape profile by comparison to the previous 2 models. All 3 variations have identifiable features that distinguish their modification from the R2Y series, with the final V3 variant appearing a massive step away from the original R2Y1 high speed reconnaissance aircraft. This page was last edited on 18 January 2019, at 02:48.